The Vikings in Cleveland, ed. Heather O’Donoghue and Pragya Vohra. Click on the link above for a pdf file of the booklet produced by the Cleveland team. Please scroll down to the bottom of this page, or click here, for the survey on Viking and Norse Cleveland (updated 5/4/2014 to .doc format). 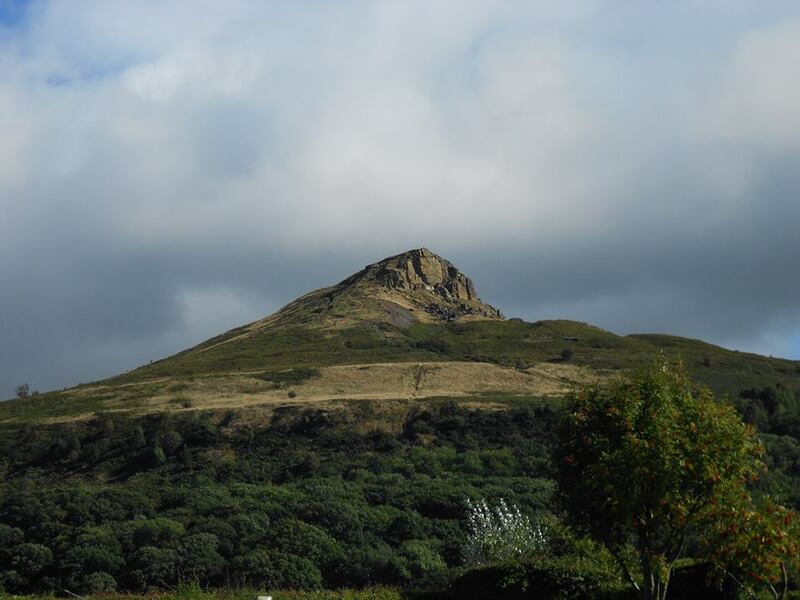 A large hill known as Roseberry Topping dominates the landscape of the Tees Valley, an area of south Durham and north Cleveland in the north east of England. Earliest forms of its name link it with the Norse god Óðinn – uniquely amongst English placenames. Nearby, a smaller hill may have been named after Frigg. Study of the placenames and dialect of the area, and of the Viking age sculpture of the Tees Valley, confirms substantial Scandinavian settlement, but were these settlers Danes or Norwegians, or even Hiberno-Norse? Popular perceptions of the Scandinavian ancestry of the area remain largely limited to images of marauding Vikings sacking Lindisfarne. And yet, a recent son et lumiere display held on Roseberry Topping was called “Odin’s Glow”, and attracted intense local interest. This is therefore a crucial point in time in which to assess and raise regional awareness of the Scandinavian element in the history of the Tees Valley. This project will work with local museums, historical societies and tourist organizations to disseminate its findings in appealing and accessible forms, and thereby engage a population already deeply interested in its recent past – as an industrial centre with a population drawn from all over the British Isles – with a more distant but even more compelling history of competing ethnicities and cultures. It will involve close engagement with the landscape of the area (including an ascent of Roseberry itself! ), and valuable interaction with local experts and public bodies. Students will be supervised by Dr Pragya Vohra (University of Aberystwyth) and Dr Heather O’Donoghue (University of Oxford, but a native of the Tees Valley), and research might include work not only on placenames, dialect and medieval history, but also on how contemporary local perceptions of Scandinavian heritage and the Viking Age north have been, and might further be, formed. If you live in this area we would love to know your thoughts on the Vikings and on your local history and heritage. Please help us out by filling in this short survey by Monday 2 June. Completed surveys can be sent to Jo Shortt Butler (click to email, or send to js616 [at] cam.ac.uk). If you require the survey in a different format we will be happy to try and provide it; hard copies will be distributed in local community centres and museums during the coming month. Hi David, sorry to hear about the problems you’ve had! That message will come up if you don’t have a programme like Microsoft Outlook installed on your PC. My email address is js616 [at] cam.ac.uk, but replace [at] with @ of course! Could you try emailing directly and we’ll see if that works? I’d really appreciate it if you could let me know what difficulties you had with filling the form out as well, so that I can try to improve it. Thank you so much for getting in touch, I look forward to receiving your completed survey.